Welcome to Royal Touch. Manufacturer, Exporter & Supplier of Plastic House Wares Products. Incorporated in the year 1997, we are an ISO 9001:2000 certified company with technically sound infrastructure & Worldwide distribution networks. We are well known in the industry for our Capacious warehousing, packaging units, customized solutions, competitive prices & timeliness. 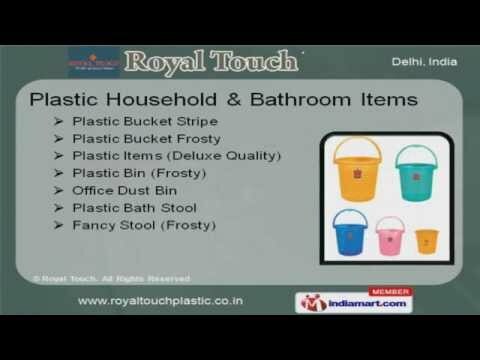 Our product list includes Dust Bin, Picks, Multi Purpose Stools, Plastic Buckets & Soap Cases. Plastic Household & Bathroom Items are some of our best selling products. We provide Dust Bin & Picks that are cost effective. Along with that we offer Plastic Buckets & Tubs that are widely appreciated in the market. Our bath mugs & soap cases are sturdy with pleasing colors. Multi Purpose Stools offered by us are widely acclaimed in the market.